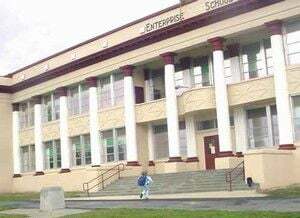 A solitary student approaches the steps at the newly refurbished Enterprise Middle School. Has the Enterprise School Board gone overboard? A controversial campaign by the Enterprise School District Board to push a student athlete’s ineligibility question to the highest levels not only utterly failed, but possibly opened another can of worms. On March 7, the Oregon Government Ethics Commission recommended the agency investigate the board’s alleged violations of Oregon’s Executive Session provisions--in particular, ORS 192.660, which governs virtually every aspect of executive sessions: procedures, news media attendance and limits. The ethics commission issued five preliminary reviews with its investigation recommendation to each of the board’s five members: Board Position 4 and chair, Kate Fent; Board Position 5 and vice-chair, Heather Melville; Board Position 1, Mandy Decker; Board Position 3, Mike Wiedeman; Board Position 2, Adrian Harguess. The documents are dated from Feb. 26 of this year. The original complainant is Ilene Wells, wife of former Enterprise school’s athletic director and present high school basketball coach, Larry Wells, who, on Jan. 4, tendered his resignation to the school board and superintendent, Erika Pinkerton, effective Feb. 22 of this year. Among other things, Wells accused Pinkerton and the board of “unprofessional behavior” in regards to the student’s eligibility request including an alleged deliberate falsification of the student’s attendance records. While the Chieftain does not possess the complaint that Ilene Wells made to the ethics commission on Jan. 30, it does possess the notice from the ethics commission that it had decided to conduct an investigation of the board regarding Wells’s complaint. Also included in the letter are the case numbers assigned to each individual board member. All are named in the commission’s response to Ms. Wells. The preliminary review of board chair, Kate Fent, case no. 19-010XSM, stated Ms. Wells alleged that Fent and the other school board members possibly violated executive session provisions, including discussing unauthorized topics, took final action in executive sessions and failed to satisfy statutory prerequisites. The review also noted that Ms. Wells stated a number of concerns with the board but that the commission only had jurisdiction to investigate executive session complaints. The complaint alleges that board member Decker confirmed to Wells on Dec. 7, 2018, that school board chair Fent and vice-chair Melville had drafted a letter outlining the board’s stance on the student’s eligibility and sent it to the student’s family on Dec. 3. Ms. Wells alleged that no open meeting was held in December or January to discuss the decision. She also said that the board discussed the employment related performance of Larry Wells without providing him notice or an opportunity to request an open hearing. Moreover, Ms. Wells alleged that the ineligible student’s family participated in the meeting to plead his case and that action was taken (the decision to send the letter), which violated the executive meeting statute in terms of the meeting’s content. The board responded to the allegations in written form, through its attorney, Luke Reese, of Garrett Hemann Robertson. The board alleged that it discussed student records, which does allow for executive session (barring members of the public). It also alleges that during the Dec. 3 session, the board only sought to reach consensus on whether to continue discussions on a letter to the student or to first send it to legal counsel. The response also called the letter a confidential student record exempt from public disclosure and discussion only regarded the content of the letter, not the decision or action underlying the letter. The board said that to the extent that a poll was taken on the letter caused minimum harm, or was exempt as they were discussing a confidential student matter and the letter was sent to the student. Lastly, the board denied it performed a formal evaluation or considered dismissal or discipline of Larry Wells although it discussed the former AD. Consequently, it did not have to notify him of a meeting. Of particular interest in the commission’s examination of the minutes is the Dec. 3 executive session that saw the council examining a draft of the letter later sent to the student, in which a roll call vote took place, and the board did not convene for a public session afterward. The commission received a copy of the letter the board sent to the student that explained why his initial request for hardship eligibility was denied. According to the commission, the letter states that Larry Wells or Blake Carlsen did not handle the student’s initial eligibility request in a timely manner or with good personal communication. The board also said they advised the superintendent not to forward the student’s eligibility request up the chain of command on academic grounds, but also asked that the superintendent review the student’s request upon regaining academic eligibility. The board also affirmed it would develop policies and protocols to better address similar situations in the future. The commission’s recommendations concluded that the Dec. 3 “letter” executive meeting possibly violated executive session provisions because of the vote on the letter that took place. It was not clear whether the vote was subject to the provisions the board outlined. Also, the commission noted that the Dec. 3 and Jan. 7 executive sessions possibly formally reviewed Wells’s performance as the board’s letter to the student possibly indicates despite its protestations that discussions of Wells’s performance didn’t rise to the level of a formal evaluation. The commission also noted the minutes to the executive sessions are so brief that certainty of what happened is negligible without investigation. In the end, the commission concluded: “There appears to be a substantial objective basis to believe that violations of the executive session provisions of Oregon Public Meetings law may have occurred on Dec. 3, 2018.” That statement was in regard to the letter vote. “Additionally, there appears to be a substantial objective basis to believe that violations of the executive session provisions of Oregon Public Meetings law may have occurred on Dec. 3, 2018 and Jan. 7, 2019. This citation regards the board’s possible discussion of Wells’s job performance. The commission document was prepared by investigator Susan Myers and approved by executive director Bersin. Amy E. Alpaugh, Assistant Attorney General reviewed the document.